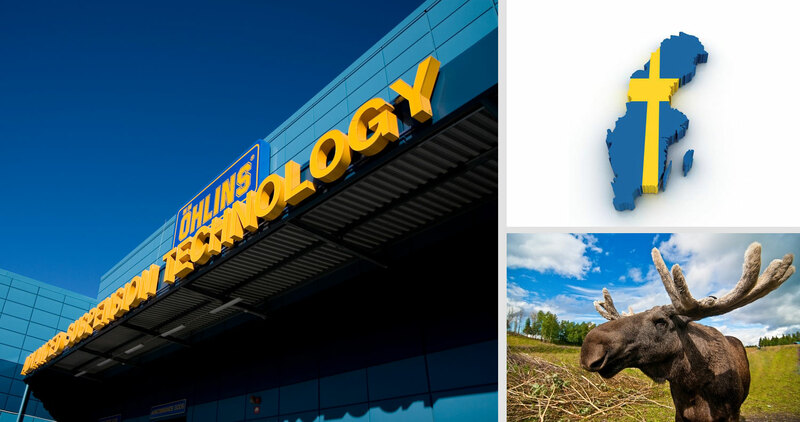 Öhlins is in an exciting time today with an unprecedented amount of racing activities around the world, new technological breakthroughs in many areas and expansion and growth into many different parts of the world. A lot has happened since we started this journey back in the 70’s. 02 – Sweden – Is there something in the water? This charming, unspoilt and sparsely populated nation (it has 21 inhabitants per km2 v 229 per km2 for Germany) is home to huge forests (65% of its surface), lakes and arctic tundra to the north. Its main industries are timber, iron ore and high end technology. Interestingly, as a percentage of its Gross Domestic Product, the Swedish government spends the most of any nation on research and development, a philosophy wholeheartedly embraced by a certain suspension manufacturer in Upplands Vasby near Stockholm. Sweden has never had F1 or MotoGP champions in its heritage but its racers have dug their own furrow, in the most earthy sense of the word….. Maybe because of its vast trails, adventurous inhabitants and easy access to land, Sweden has always been passionate for both Rallying and Motocross disciplines. 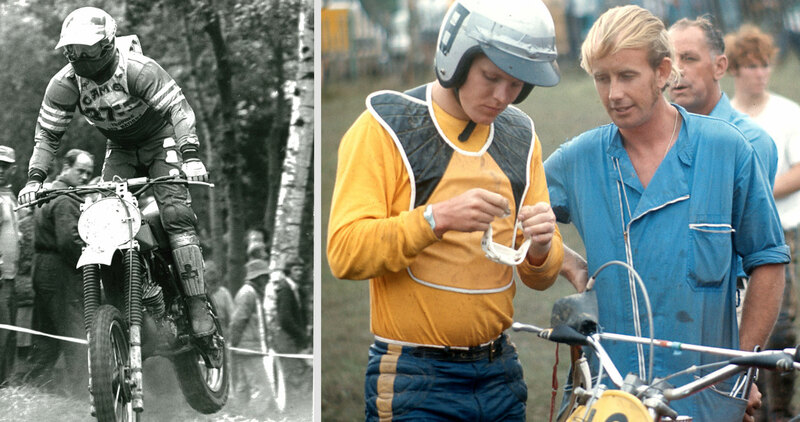 Home to legendary off-road bike manufacturer Husqvarna, Swedish riders were prodigious in World Motocross through the 60-70’s with riders such as Bill Nilsson, Bengt Åberg, Torsten Hallman and ‘our’ own Thorleif Hansen. 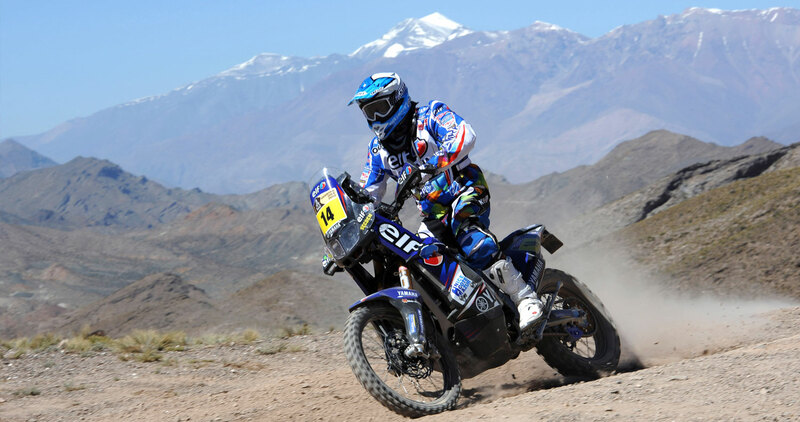 In the ‘hardman’ events of Enduro, Anders Eriksson took the World crown an incredible seven times. It was in this backdrop of competitive spirit and pioneering engineering that Kenth Öhlin first rode then plied his trade, to lay the foundations that were later to come. Speedway and ice speedway are incredibly popular in Sweden and rank only behind football and ice hockey for viewing numbers. On four wheels Stig Blomqvist, Per Eklund, Björn Waldegård and many others showed the world that Swedish Rally drivers were a force to be reckoned with. The legendary Rally Sweden has now run since 1950 and is seen by many as the ultimate test of winter driving and is part of the prestigious WRC series. Sweden has of course had success on the tarmac most notably with two time F1 runner-up Ronnie Peterson, who was taken before his time at Monza in 1978 and is still considered one of the all time greats with massive unfulfilled potential. Kenny Bräck took on the Yanks at their own game winning the Indy500 and Indycar championship whilst Rickard Rydell was a BTCC superstar in the 90’s..On two wheels double World 125cc Champion Kent Andersson flew the blue and yellow flag in the eight litre GP class. WORD ASSOCIATION… LIVING THE STEREOTYPE? We ran a ‘Performance’ test and asked 100 ‘foreigners’ what words they associated with Sweden and these were the top results; healthy living, modern, clean, design lead, blondes, forests, Midnight Sun, Vikings, Volvo and of course, Abba! 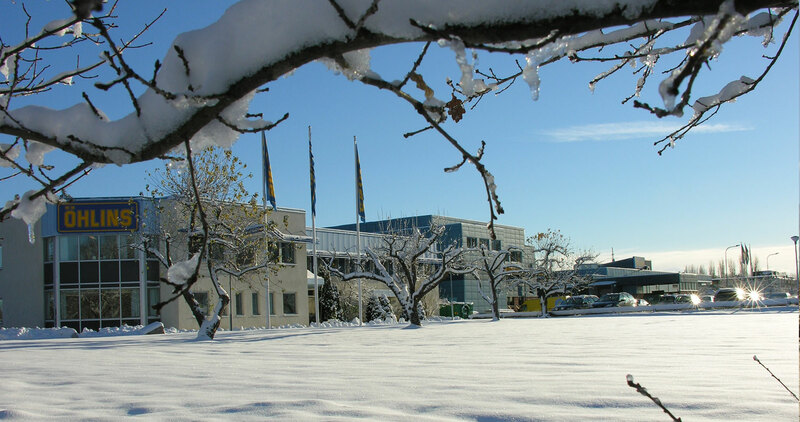 As a visitor to the Öhlins factory this writer can confirm many of these stereotypes to be true and maybe, just maybe, are attributable in part of the DNA of this unique, worldwide brand. The factory is indeed incredibly clean, efficient, modern and functional as you would expect, even to the extent that the staff canteen was a pleasurable experience! There does seem to be a very high number of blonde employees at the factory, albeit mostly with moustaches and of the male variety. We also misjudged each interviewee’s age by at least a decade, a nod to that healthy living, ‘swimming up an icy river’ image that we may have of the Swedes. Every employee we spoke to seemed driven by a warm enthusiasm and pride for their job and for the company itself, a rare quality in any workforce. Many of the team had spent time in the racetracks of the world assigned to two and four wheel squads or as R+D technicians. There is a sense of constant exploration and a desire to pioneer in new lands, perhaps part of the Viking bloodline but of course without the pillaging. Obviously these are mere anecdotes and as we have said National stereotypes but you get the feeling that the Öhlins phenomenon has been created by the geography, history and people of Sweden. • Sweden boasts one of the highest life expectancies and one of the lowest birth rates in the world. • Right hand driving was adopted in Sweden in 1967. One day at 4.50am everyone had to change from the left over to the right hand side of the road, in a perfectly executed logistical operation! • All the Tsars of Russia till the last one, Nicholas II, were of Swedish Viking descent. • On an average, Swedish women have their first child at 30 years. • Some of the greatest pop bands and singers are Swedish, viz. Abba, Roxette, Ace of Base, A*Teens, The Cardigans, Robyn, etc. • Sweden has the highest number of McDonald restaurants, per capita, in Europe. • Sweden has the highest number of nuclear plants, per capita. • Sweden was the first country to grant suffrage for (married) women in local elections. • The first ice hotel of the world was built near the village of Jukkasjärvi, in Kiruna district of Sweden. • The largest hemispherical building in the world, ‘The Stockholm Globe Arena’, is in Sweden. It is also the ‘largest scale model of the Solar System’ and hosts Ice hockey, sports and concerts. • The proportion of personal computers, per capita, in Sweden is the highest in Europe. • Swedes have been known for a number of inventions, including astronomical lens, zipper, marine propeller, refrigerator, computer mouse and pace-maker. • The Nobel Prizes were founded by Alfred Nobel, a Swede who invented dynamite in 1866. • The favourite dish of Swedes usually comprises of meatballs, with potatoes and lingonberry sauce. • A popular souvenir in Sweden is the road sign for moose-crossing. Surprisingly, a large number of these signs are stolen from Swedish roads every year, mostly by tourists! “Of course I don’t ache,” Thorleif Hansen looks almost confused by our question. As one of the main motocross test-riders for Öhlins for over three decades, you’d be forgiven for thinking the man who was raised a mere tabletop jump from the factory might be due a rest, “I love my job so why stop? Maybe in four or five years time when my wife retires so will I, we’ll see. I think hanging around young guys keeps you on your toes, so that’s good,” reasons Thorleif. Two of those younger guys are his sons Terje and Robin who also work at the impressive Öhlins factory at Upper Vasby near Stockholm, so maybe he also wants to keep them on their toes. “For sure it’s great that my boys work here but I try and let them go their own way. 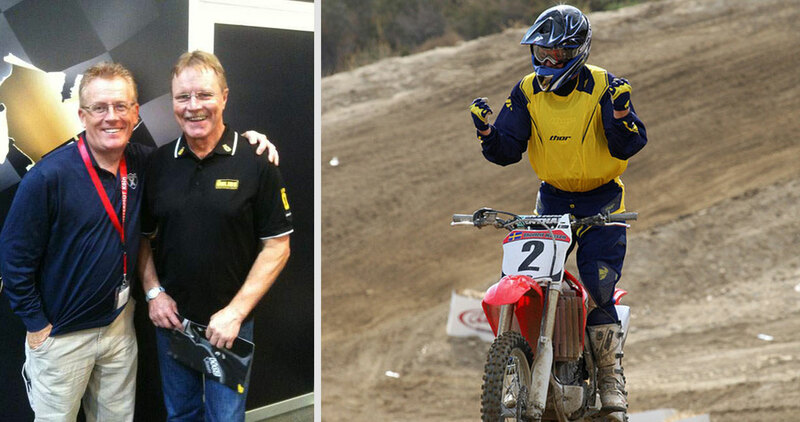 Eldest son Terje followed his father’s footsteps into motocross GPs and then to the US race scene as a suspension technician whilst Robin has chosen a totally different route and now works in the automotive division. One can’t help thinking that Thorleif is an inspirational character to more than just his two offspring in the Öhlins HQ. His story goes back as far as that of his friend and employer Kenth Öhlin, who he raced against in the fiercely contested Swedish MX series in the late 1960s. Although a talented rider in his own right, Kenth recognised Thorleif’s impressive skills and instead of competing against him, using his engineering ability he first modified then made new suspension units for Hansen’s factory Kawasaki to great effect. “It was a never ending season, we’d finish up the World Championship then head out to the States to do twelve American races all over the country. I realised America is a big place but it’s even bigger if you have to travel by car! It was such a great experience, I was based out of California and it was a fantastic time to be there. 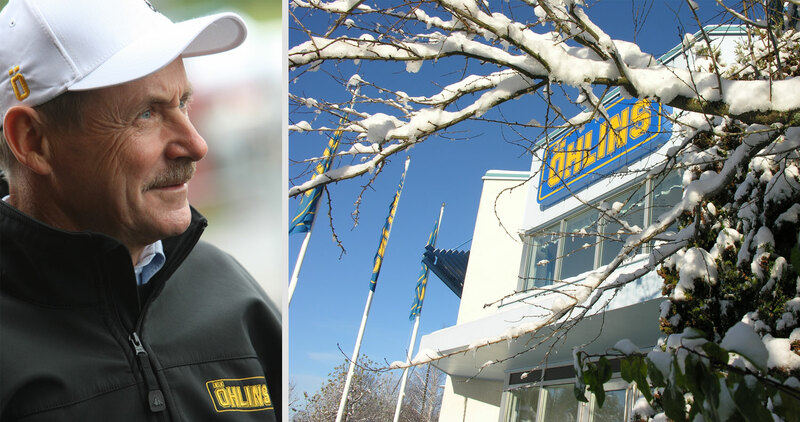 When Thorleif finished his GP career in 1978 after a brilliant second place series finish in his favoured 250cc class, he went to work at Öhlins until 1987 when he decided he should try his hand at something else, in this case the construction industry. However before long he got a call from Kenth saying ‘it has been ten years, it’s time to come back’. A part-time test riding job soon turned into full-time and he’s still there now, enjoying his days making a difference at the factory. 04 – Alaskan ice race sorts the big dogs from the pups! The event was originally devised to prepare the ground for the famous Iditarod dog-sled race, so that that the terrain wouldn’t be deadly to the huskies needing to drive sleds through deep snow. But putting “snow-machine” (snowmobile) teams on the course, and having them ride from end to end is, well, a race. So it took only a few hours for the organisers to admit that and start handing out trophies, allowing the event to mature into a respected endurance race of its own, involving not barking huskies but ‘iron dogs’. It’s an endurance race where broken parts can be more deadly than high-speed accidents and where a teammate is a life-saving requirement. This year the Iron Dog started in Big Lake, Alaska, near Wasilla. From there the course headed North-West to Nome, then finally back east to Fairbanks. The race began this year on February 19th, at 11am. That means that there was a glow of twilight in the southern sky when the race began and also the amazing dancing Northern Lights. 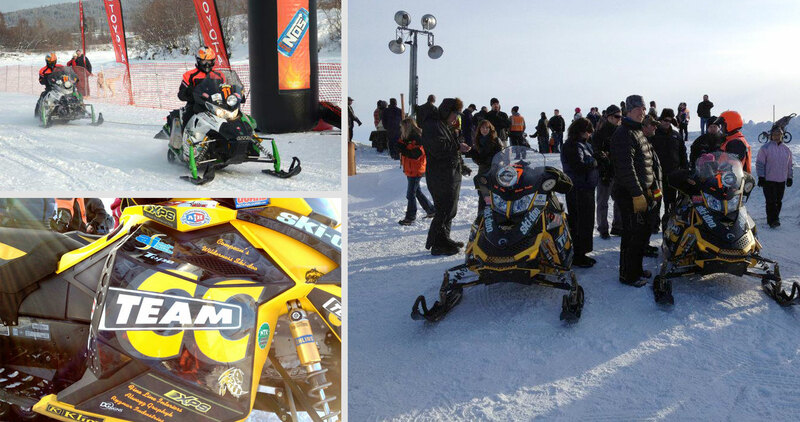 About 30-40 teams compete in the Iron Dog each year and they are required to have two sleds and two riders for safety. During the race nothing is allowed to be abandoned out on the trail and the event is carefully regulated to protect the wild environment of Alaska. The fuel stops are about every 100 miles and all are manned with hardy volunteers. Winning driver VanMeter said at the finish “I’ve been doing this race for 17 years, it’s an addiction. Any stupid thing can take you out. Last year we had a lead like this year and it was 20-below with blowing snow. They’d dug a hole into the river and down I went into it. I was soaked up to the waist and my partner got me out and to a local village. We lost six and a half hours and lost the race by about 90 minutes. We’ve got two good riders and the proper equipment, we know what to do to win, but anything can happen in the middle of nowhere. I do all of our suspension work to make them ride properly. 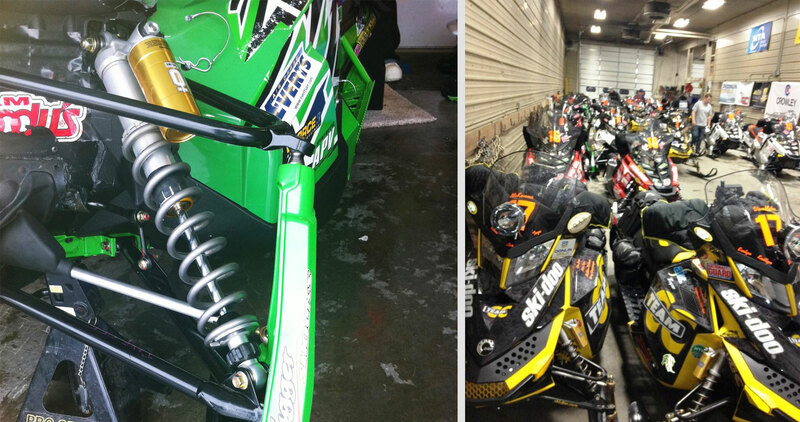 I’ve been running Öhlins since 2009 and no one can keep up with us. We’re literally doing 80-90 mph over two foot bumps, and if you don’t have good suspension you’re going to break the sled or crash. It was rough over the ice, which can rip your machine up. I set the shocks up and valve them to get the best oil flow. They never fade, they never fail. Ron Zugg, owner of Zugger shocks in Palmer, AK, (zuggershocks.com), told us, “This is a big deal for us as it’s only the second time that Ski-Doo has won this race. This event is so rough and the conditions are so hard, a failure takes a team out. Reliability wins this race which is why most guys are on Öhlins now. The Iron Dog is a mix of speed, deadly temperatures, high wind, rough terrain, endurance, surprise obstacles, moose, and the dark of a never-ending night. Is there a more grueling test of man and machine? It’s doubtful! 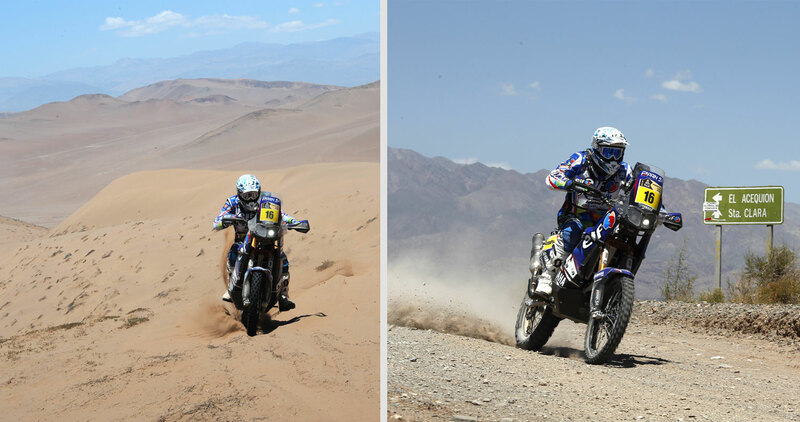 So, which national motorcycle race series is the most watched? The massive American AMA Championship backed up by 10 million registered bikes? The Japanese JSB class where most of the world’s sports bikes come from? The Italian Superbike Championship – from the land of Rossi, Ducati and the most passionate fans? The answer may surprise you. 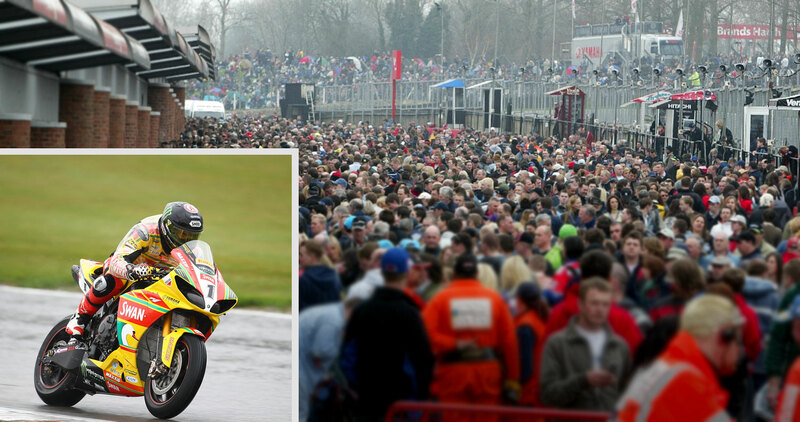 It’s none of the above, the most watched national race series is the British Superbike Championship. A series held on a small and often rainy island, that last won the blue riband 500cc GP class back in 1977, regularly attracts over 400,000 paying spectators throughout the season. The real question, and one that the organisers of the other series should be asking themselves, is simple – why? 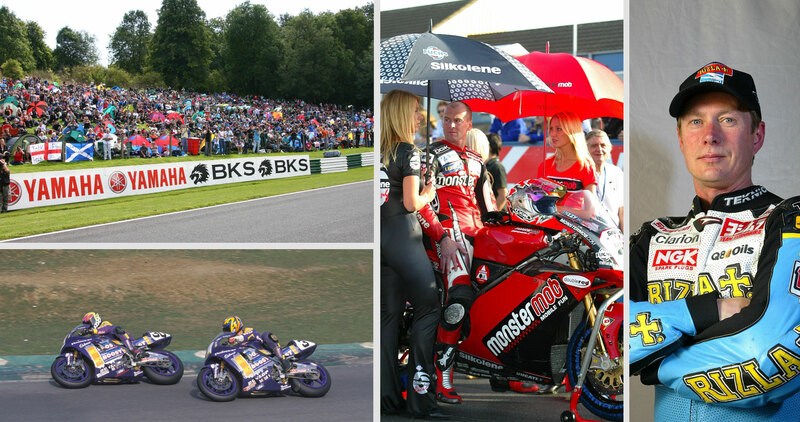 The reasons are numerous but include a long history of motorcycle sport, a multitude of excellent venues (including the world-renowned Silverstone, Donington Park and Brands Hatch circuits) and crucially an organising body that continually changes the rules to keep grids full and the racing close. This year the series travels to the Cathedral of Speed – the mighty sweeping circuit of Assen – possibly signaling even wider ambitions. It is to this bubbling cauldron of competition that Öhlins takes great pride in its record of 14 British Superbike (BSB) crowns in just 16 years, relying heavily on its national distributors and service centres such as Harris Performance. Enormously impressive in a series that can only be described as ‘talent heavy’. BSB has always attracted some impressive competitors with home grown stars Niall Mackenzie, Neil Hodgson, John Reynolds and Shane Byrne having mixed it up with living legend, and 1999 BSB Champion, Troy Bayliss as well as last year’s runner up, GP hero John ‘Hopper’ Hopkins. What links all of these riders? Each one sported gold forks and shock absorbers on their bikes. For 2012 the series organisers decided to try and curb costs with a number of measures including a single spec engine control unit (ECU) effectively outlawing traction control, anti-wheelie and launch control. If anything, these changes have meant that rider skill and the team’s ability with chassis set-up have become even more important than ever. Suspension technician Richard Brendish, from long-time Öhlins distributor Harris Performance, explains: “The relationship between the rider and his suspension engineer has probably never been more intense. Riders are much more savvy in terms of what change has what effect. There’s a lot of analysing and the level of sophistication is higher than it has ever been. You can achieve such subtle changes, but in a field as competitive as the 2012 BSB, small changes can be the difference between first and fifth place. “I’ve been in the paddock twelve years now, starting with our own Harris SP Honda SP-1 with Shakey Byrne, through Crescent Suzuki, Virgin Yamaha, GSE Ducati and then HM Plant (now Samsung) Honda. In that time the paddock has become more professional; teams realised they needed the best technical support and so we grew our support. We started out with a Transit van and it grew until we built the ‘artic’ – we expanded with the series and the bike market – which was burgeoning at the time. Niall Mackenzie was British Superbike Champion from 1996-1998 for Cadbury Boost Yamaha and the triple BSB champion continues to live in the BSB paddock, helping his two sons at the start of their racing careers; “I remember in 1996 when BBC started broadcasting BSB, it was a massive help getting sponsors and increasing the level of competition within the series. That ethos continues to this day, it’s so professional with big crowds and a vast depth of talent. “Our Yamaha YZF750s were ex-factory World Superbike machines and we had a great link with the Öhlins technicians. My crew chief Ade Marsh was very good at translating what I could feel on track and using his skill and knowledge to make the required changes to the suspension and chassis. We rode the two WSB events each year at Donington Park and Brands Hatch, both of which provided a great opportunity to catch up with the Öhlins guys. The movable handlebar clamp needs something like 0.5 degrees of movement before the damper is activated. A larger amount of movement gives a feeling of too much ‘play’. The flex in front fork and front wheel is greater than the movement of the movable handlebar clamp so you do not notice the movement when you ride. Therefore the S3 is continually ‘monitoring’ the way the steering is being applied in relation to the front wheel. The result is a damper that feels very natural at low speed and remains ‘inert’ over jumps, helping the rider with low speed control. However when there is a sudden input from an outside force such as a rock or tree root, the system instantly activates to increase the damping. What is important to note is that the system doesn’t use any electrical or electronic componentry- everything works mechanically and hydraulically. In these days of almost complete electronic control it is nice to know some systems rely on mechanics and ‘feel’. Audi’s main competitors, Toyota, made their welcome return to Le Mans with an imporess display but were ultimately ruled out of the running with two accidents, one of which most notably was a high speed collision and backflip of the No. 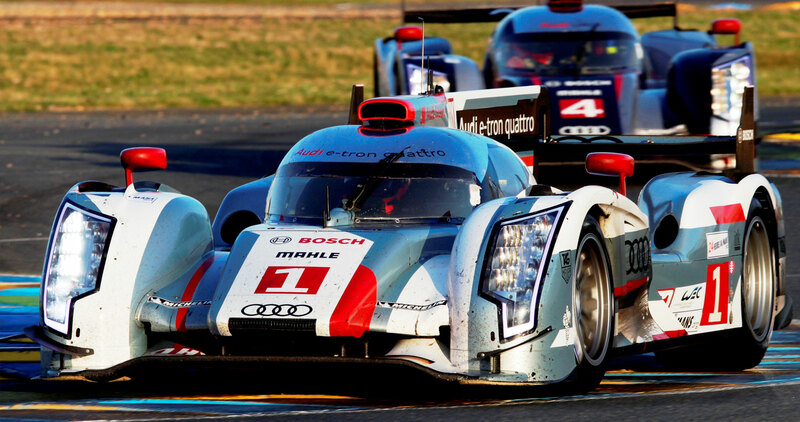 8 car driven by Anthony Davidson as he went airborne at the Mulsanne Corner. This year sees the introduction of Global Rallycross – televised on ESPN, the series is run in conjunction with NASCAR Sprint Cup and IndyCar weekends as well as the iconic X Games 18. No sooner had this bombshell landed had speculation began on the World Champion’s replacement – with both series leader Lorenzo and fan/sponsor/media favourite Valentino Rossi rumoured to jump ship to the Repsol Honda HRC squad. As a result Yamaha moved quickly to retain their prize rider Lorenzo, leaving Rossi with a possible get-out opportunity after eighteen months of underachievement at Ducati. This one will run and run…. MotoGP now has a class-within-a-class, or to the detractors, a ‘sideshow’ – the new for 2012 CRT or Claiming Rules Team machines. With ‘production’ engines allowed in prototype chassis’, this brave new world has angered purists but crucially boosted the ailing grid to respectable numbers and is host to some of the elder statesmen of thesport in the shape of Colin Edwards as well as some young pretenders hoping to impress. WSB – The Veterans fight on! 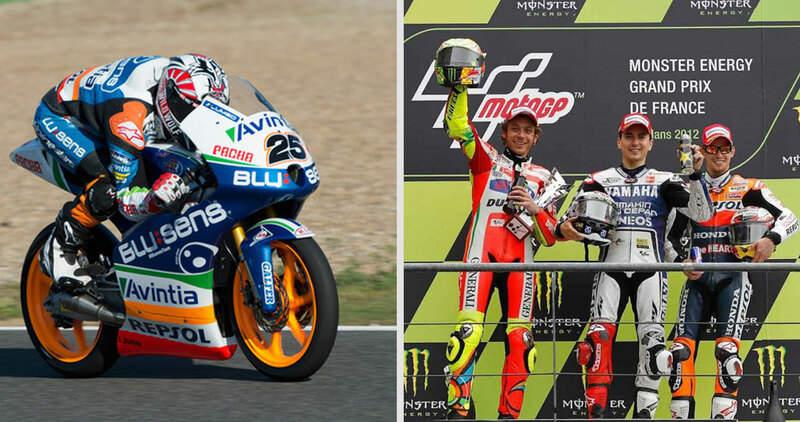 As the World Superbike series reaches it’s Summer break it has been the ‘Old Boy Network’ of GP refugees, Biaggi, Checa and Melandri, who continue to show the way to the ‘young guns’ in terms of race wins with eleven victories shared between them up to the Aragon round. 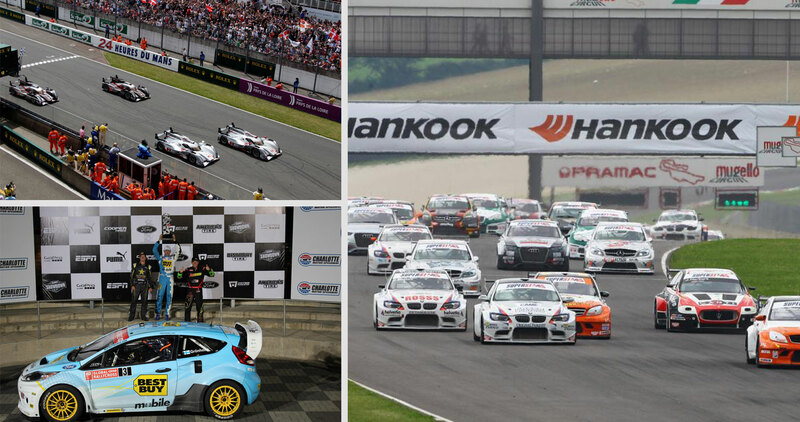 As the series celebrates its 25th anniversary the ‘playing field’ has never been more evenly matched with six winners from six different teams in the thirteen races so far. The top nationalities in the standings are predominantly Italian and British and the organisers will inevitably be looking to widen the ‘gene pool’ as the series looks further afield (Russia in ’12, India and Indonesia in ’13). The British Superbike series was won last year by home-grown hero Tommy Hill, pipping ex-GP hero John Hopkins by a hair’s width 0.006 seconds in a Öhlins shod 1-2. Tommy continues to lead the series in ’12 at the time of writing on his Swan Yamaha and has been rewarded with a shot at the prestigious Suzuka 8 hour in Japan with the original Sultan of Slide, Noriyuki Haga. You can read more about the BSB series here. Once the most revered series in the world, the US AMA Superbike championship has fallen on rocky ground in recent years but there are strong signs of recovery with returning crowds, teams and great racing. At time of writing an Öhlins trio ‘lock out’ the top spots with 2011 Champ Josh Hayes leading Suzuki Yoshimura’s Blake Young and his Graves Yamaha teammate Josh Herrin. 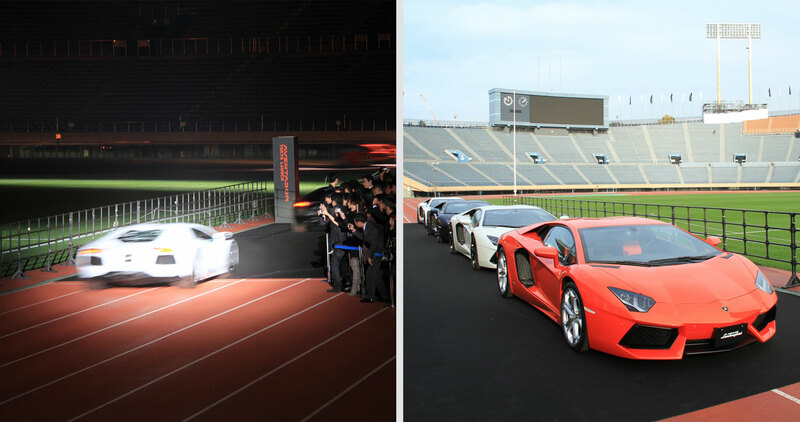 AThe Aventador is Lamborghini’s latest proof of the above statement. The name for this latest €255,000 Italian thoroughbred is taken from a bull, famous for its bravery in a Spanish bullfight having earned the Trofeo de la Peña La Madroñera at the Zaragoza Arena in 1993 for outstanding courage. Described by the Bolognese manufacturer as: “a new reference among super sports cars,” the bold, aggressive lines of the Aventador epitomise Italian supercar style while the depth of technology is way more than skin deep with a lithe, lightweight chassis and carbon fibre monocoque powered to a terminal speed 217mph (349kph) by an immensely powerful, 700bhp V12 engine. Lamborghini’s dedication to building the best supercar that they could has resulted in some amazing new technological developments. The immense power is managed by several drivetrain ECUs, managing and metering the power output to each wheel through the Aventador’s sophisticated four-wheel-drive system incrementally to achieve the best balance of drive and grip. Naturally, refinements inside the car are as you’d expect from a car of this pedigree with the driver cosseted by a full leather interior, the driving experience enhanced by a state of the art stability control system, intelligent ABS and brake distribution along with three engine performance modes available at the push of a button to suit the driver’s mood. A navigation system with traffic data and iPod connectivity ensure that the interior of the Aventador is always a happy place to be. 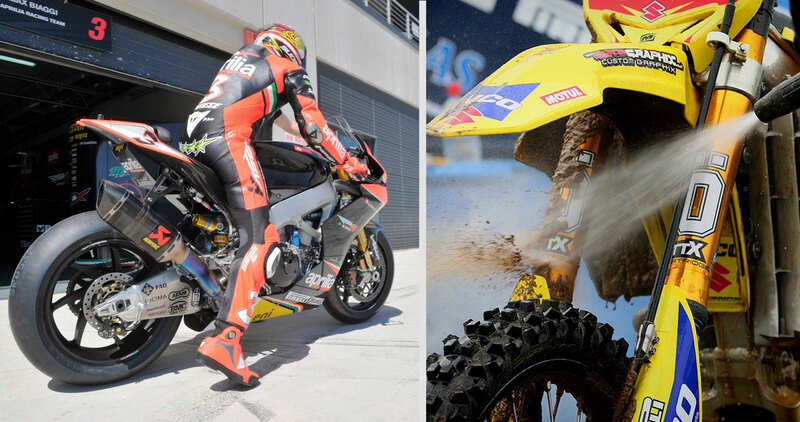 Öhlins’ history with helping Italian engineers to achieve superb handling goes back a long way. In the two-wheeled world, some of the most exotic motorcycles ever built have been fitted with Öhlins suspension with manufacturers such as Ducati, Aprilia, MV Agusta and Benelli all insisting on those trademark gold forks and yellow springs to ensure road holding that is unsurpassed by their rivals. 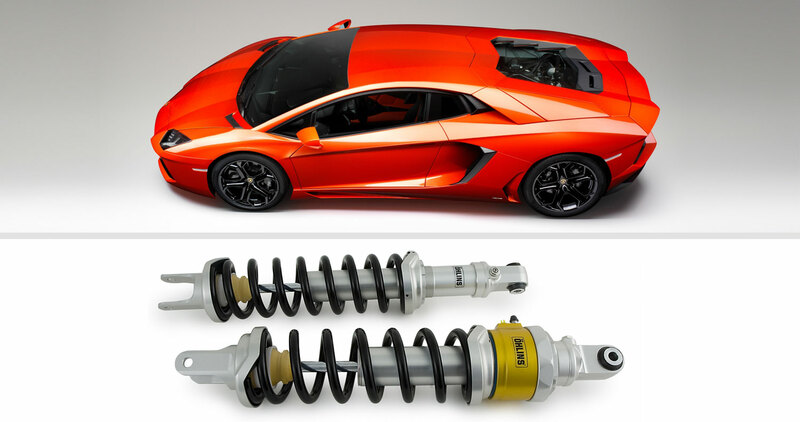 So how did Öhlins put shock absorbers on the Lamborghini Aventador? The company started with a proven damper type, a conventional mechanical damper of the same type that has been used in NASCAR racing. This damper type was deemed especially suited to cope with the high forces a heavy supercar generates. After that the engineers put a lot of effort into making this race damper silent and comfortable, functional down to minus 40 degrees Celsius and be reliable for at least 200 000 km of usage so it could meet the high demands set by Lamborghini Another demanding factor was the placement of the rear dampers in the rear engine compartment. The heat generating from the supercar’s engine meant Öhlins had to find special bushings to withstand this heat and the Öhlins stickers on the dampers also had to be modified to cope with the heat. The dampers also had to be fitted with electrically adjustable actuators to lift the car up to cope with curbs and speed bumps. The end result was a supercar with superb handling that can be used everyday. 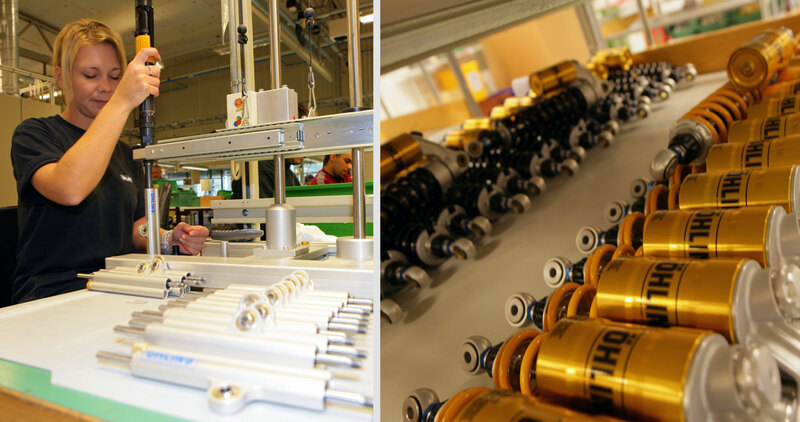 Öhlins Project Manager Rade Catovic explains, “We had to do a lot of work with testing and certifications to meet these demands and we especially spent a lot of time working on making the damper as silent as possible. 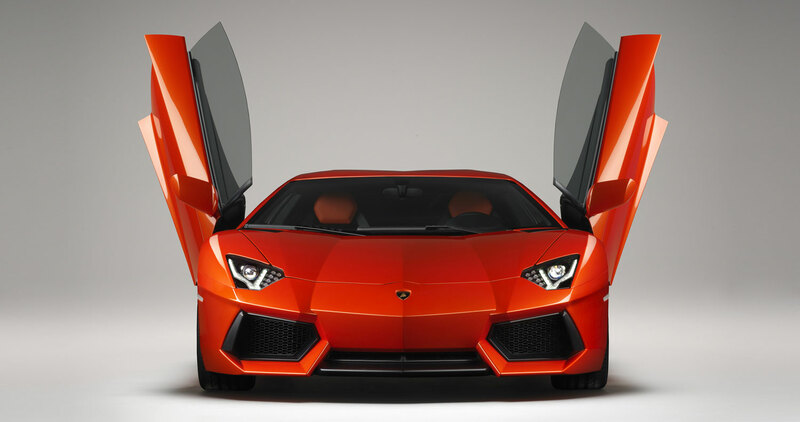 Considering the demands Audi and Lamborghini had, the Aventador really is one of the rare supersport cars that can handle both everyday use and driving on race tracks”. Öhlins’ racing heritage also draws many parallels with the Italians. A shared outlook that while performance is paramount, the aesthetics should never be overlooked with the question of form over function never being raised, the two working together in perfect synchronicity. And that’s exactly what Lamborghini and Öhlins have achieved with the Aventador. 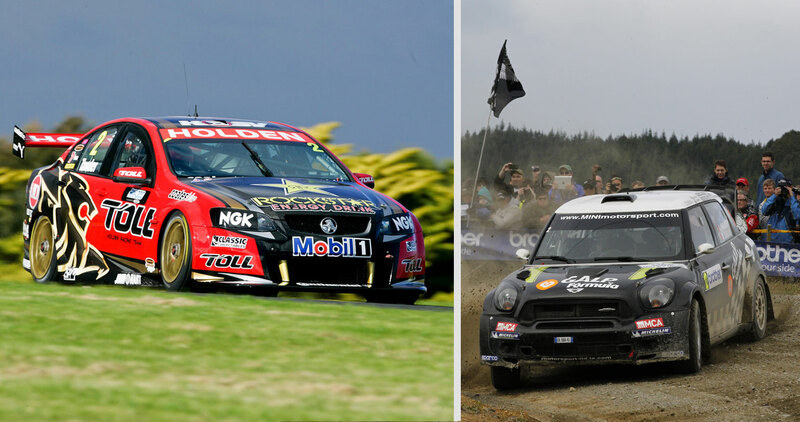 Few success stories are as compelling as Prodrive’s own. The British engineering and technology firm has been at the very heart of rallying for more than 27 years notching up more than 100 international rallies and six World Rally Championships. 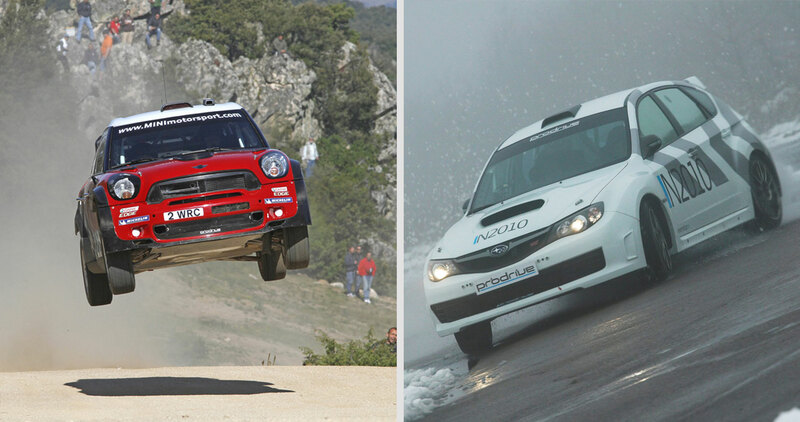 Their motorsport involvement also stretches beyond rallying with successful touring car, GT and endurance racing programmes but it is perhaps their rally success for which they are best known and specifically their success with Subaru. 1988 saw the firm’s first foray into rallying, developing Sierra Cosworth dampers for the original Stig, Mr Blomqvist. At the time, Ford, like many other teams used to have to bring literally hundreds of set-rate damper options on event with them, having to change the entire set-up for each and every stage, to suit weather and surface conditions. Öhlins engineer Thomas Pettersson saw a much easier way and developed adjustable dampers instead; meaning teams only had to carry a handful of spare dampers instead of an entire service-barge full. The sport changed overnight. Around this time, another Swedish driver, Harri Joki turned to Öhlins to develop an adjustable solution for his 2WD Peugeot 205 and 306 rally cars. 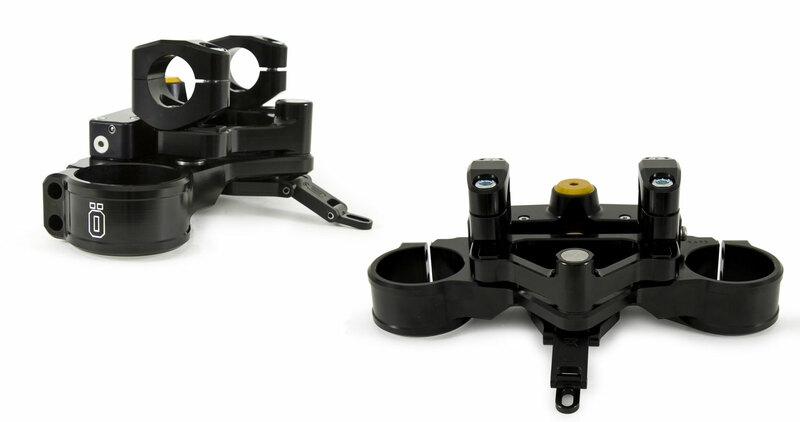 Öhlins in-house guru Lars Osth created a set-up using existing Öhlins components – and the start of what we know as their ‘kit system’ was born. The early ’90s saw Öhlins partner with Toyota Team Europe, creating dampers for the legendary Celica Group A car and subsequently the later Toyota Corolla WRC machine. 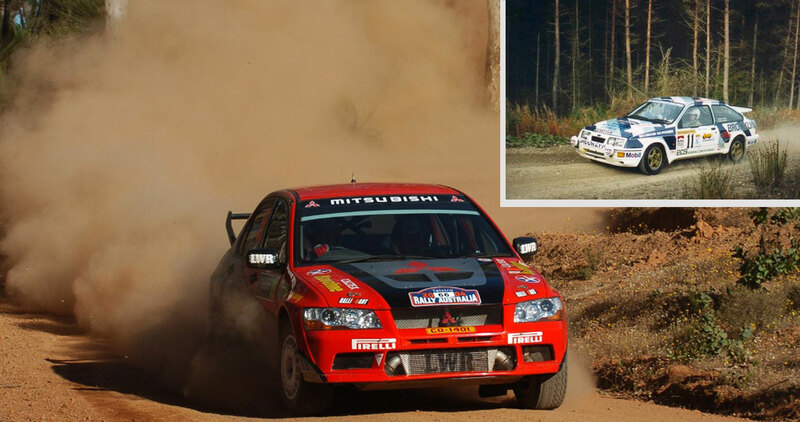 The Mitsubishi Lancer with Tommi Mäkinen at the wheel, dominated World rallying in the late ’90s, culminating in no less than four Championship wins on Öhlins dampers. This partnership continued into other off-road genres, with the Paris-Dakar Pajeros also relying on the damper’s unique characteristics and legendary build quality. Since then, the list of manufacturers that has relied on Öhlins has been as long as it is impressive. Hyundai’s WRC effort, Peugeot’s WRC customer builds, and even Prodrive’s ill-fated 2009 car have all flashed the gold under their flared arches . Latterly, the firm has moved its attention towards Group N, where they have proved to be an obvious choice to teams and constructors running Subaru and Mitsubishi. 2WD pedallists were always catered for too, however, with Renault’s Clio and Megane packages also rolling out of their respective factories on Öhlins. We’ve all seen custom cruisers with chromed wheels, high bars, studded seats and the like but rarely do you see one that has been customised with a set of Öhlins FGR900 forks! 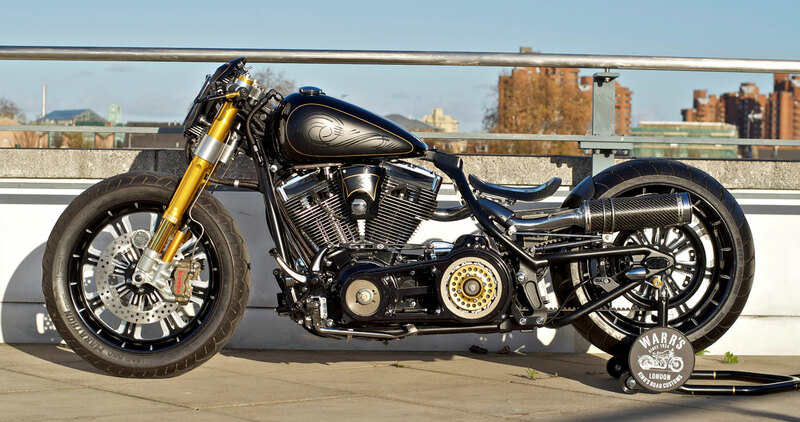 The machine started life as a 2010 Harley-Davidson Fatboy and this very open-minded customer wanted his bike to be the ultimate in individuality. “The base machine was stripped down leaving just the engine and chassis. The oil tank was removed from beneath the seat and the chassis re-shaped to drop the solid, one-of-a-kind, carbon fibre solo saddle- giving an extreme slammed ride height and position. A new oil tank was fabricated to fit inside the original teardrop shaped Fatboy fuel tank. We crafted the high-low dual exhaust system which houses the rear lights in the carbon mufflers. 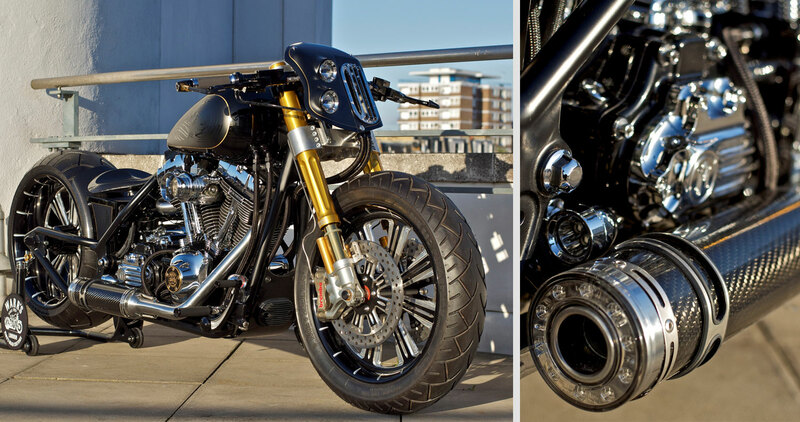 To enhance the bikes fierce stance only a pair of the highest spec Öhlins FGR900 front forks paired with Öhlins Softail rear suspension would do. Gareth from Reactive Suspension and our own in-house race mechanics fitted heavier springs and tuned it to the increased mass and its strange geometry. We custom made CNC triple trees to mount the forks to the frame. Brembo monobloc calipers were fitted to deal with the brute force of the new tuned 113ci Screamin’ Eagle H-D Engine which we covered with glossy black powder coating and the cooling fins were diamond cut for a show sparkle. Carbon fibre, race style clip-on handlebars were fitted with Performance Machine controls to match the huge wheels wrapped in Metzeler rubber, 3″ open primary drive and foot controls. With four other projects now boasting Öhlins, we ask what is the fascination with the brand for a builder of American custom cruisers? “I guess I love the in-your-face attitude of the forks, the level of quality of the componentry and quite simply you know that they are the best in the World, if all the teams buy them you know they are the ‘nuts’ ! 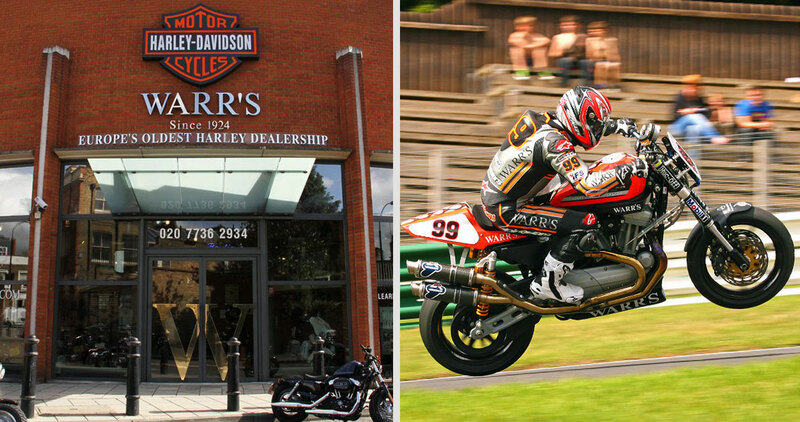 As Europe’s oldest Harley dealership Warr’s have a successful racing history of their own; supporting the legendary Cal Rayborn in his ‘Transatlantic’ campaign days and more recently taking Jeremy McWilliams to Daytona 200 success on a Buell- using Öhlins, which is now OE on Erik Buell Racing Motorcycles. The company also won the Harley-Davidson XR1200 series (again with McWilliams) run alongside the BSB series using Öhlins equipment. You can learn more about Warr’s at www.warrs.com , on Facebook and follow them on Twitter. 02 - Sweden - Is there something in the water?